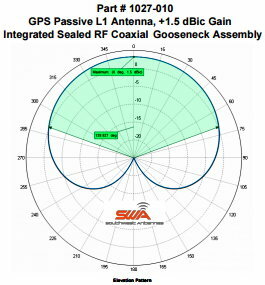 San Diego, California, May 1, 2017 - Southwest Antennas, an industry leader in innovative rugged RF / microwave antennas and accessory products, has released a newGPS passive L1 antenna with integrated coaxial RF gooseneck, adding to their existing line of passive and active GPS antenna products for the military, law enforcement, and commercial markets. The integrated gooseneck allows the GPS antenna to be utilized on tactical radio systems where multiple antenna RF connectors and control knobs can located in a small space, giving users the ability to position the GPS antenna up and away from areas of mechanical interference. The gooseneck also allows the GPS antenna to be easily repositioned vertically to face the GPS satellite constellation if the attached radio is placed on its side, set into a vehicle dock, or other non-vertical operating positing. This ensures accurate GPS position and timing for mission critical applications. Southwest Antennas Part # 1027-010 features an operator-friendly compact size and light weight achieved with a quadrifilar helical design, in addition to providing an axial ratio of 1.0 dB, offering excellent performance in noisy RF environments. The entire product is environmentally sealed and waterproof to a depth of 20 meters / 65.6 t, allowing the antenna to be used in all weather conditions and maritime operations. Additionally this product can also be configured with an Active L1 GPS Antenna (+11 dB Gain) and different RF connectors upon request. Contact Southwest Antennas for more information. Part # 1027-010 is available now from the Southwest Antennas website, sales representatives, and authorized distributors and resellers. Southwest Antennas specializes in the design and manufacture of rugged, high-performance RF and Microwave antennas, accessory products, and customized antenna solutions built for today's demanding communication environments. Founded in 2005 and headquartered in San Diego, California, Southwest Antennas offers over 1,000 standard products for broadcast video, military / defense, law enforcement, homeland security, surveillance, aerospace, oil and gas, and M2M markets.